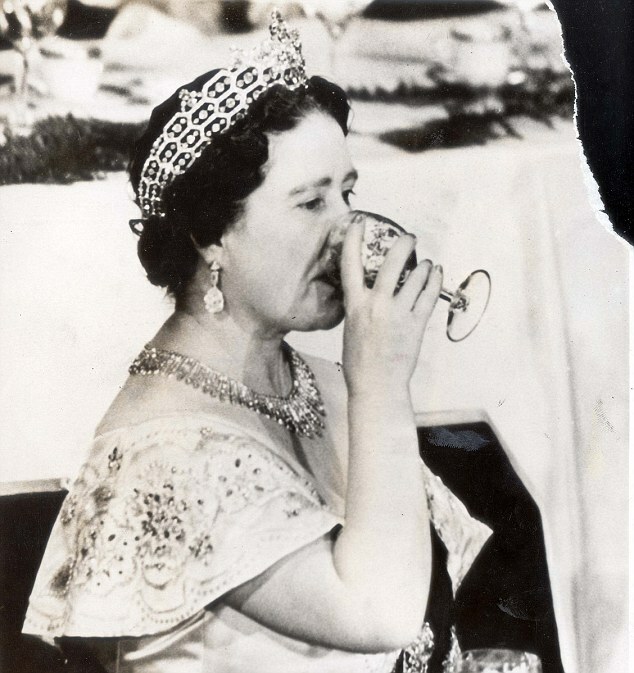 The Queen Mother Elizabeth in a classic pose as she sips on a glass of wine. For decades Queen Mother Elizabeth (1900-2002) was without a doubt the most loved part of the British Royal Family. The mother of the United Kingdom’s current queen Elizabeth II became a national icon. She gained sympathy as she ‘made’ her insecure husband George VI a good king, gave people hope in World War II and lost her husband half way her life. After the early death of George VI in 1952 she started her role as Queen Mother, the matriarch of the Royal Family, and lead the British monarchy through many serious crises. Always with a daily intake of at least 8 units of alcohol, according to modern standards she would be labeled as a heavy drinker. Still the Queen Mum lived to see 101. Even though Queen Elizabeth, the daughter of Lord Glamis Claude Bowes-Lyon, wasn’t exactly working class before she married into the British Royal Family, she gained huge popularity among the people. Mostly because she genuinely seemed to care for the common man, but also because she showed human signs. Her drinking habbits commonly known and respected. As Queen Mum she had a steady pattern in her alcohol consumption that she held onto till her dying days in 2002. Major Colin Burgess, the personal attendant to the queen, describes this in the book Behind Palace Doors. According to Burgess Elizabeth would start at noon with a cocktail with 1 part gin and 2 parts Dubonnet, topped off with a slice of lemon or orange. The official name is a Zaza cocktail or a Dubonnet cocktail, but thanks to Elizabeth everyone around the world now calls it the Queen Mother cocktail. At lunch the Queen Mum would drink red wine and after the meal a glass of port. According to Burgess she also insisted that the people around her joined her. When anyone dared to ask for water, Elizabeth would ask incredulously: “How can you not have wine with your meal?” At 6 in the afternoon it was what the Queen Mother would call ‘Magic Hour’ and she had herself a martini. And at dinner she would drink 2 glasses of Veuve Cliquot, a pink champagne. No wonder the English were quite fund of this woman, who reached the impressive age of 101 years. With an estimated alcohol intake of 70 units a week, which would be 10 times the amount of a female heavy drinker in the United States and twice the amount of one in Britain these days. God save the Queen, cheers! Because on a Sunday, who doesn’t love stories about aristocratic alcoholics? Nope… To make things easy (not) her daughter, the current queen of England, is also named Elizabeth. She is Prince Charles’ mother. Reblogged this on Ian's Business & Tech Blog. I think it’s hilarious (and actually laudable)that the old girl was pounding the plonk on a daily basis. She obviously had a real zest for life and knew how to live it. She seems like the antithesis of the usual assortment of power sucking servant slapping gits and twits and it’s easy to see why she was so well loved. Absolutely! Ladies like her don’t come around too often. Always love to hear another story about Good Queen Mum! She was the spitting image of my own lovely, laughing Nana, and I always like to think that the two would have gotten along famously if they’d ever met, let alone shared a few good stiff ones. Thanks for reminding me it’s almost time to pour one of my own! “anekdote” ? is that some kind of royal cocktail? Don,t care about her drinking but why did she not care about her mentally handicapped neices? so cruel . The first thing any student of history learns is not to judge the past in terms of the present. Although it may seem cruel to us, “sending them away” was the usual practice of that era. Moreover, they were well cared for, the generalized and inaccurate assertions of Channel 4 notwithstanding. (Cf. the Telegraph’s rebuttal of them.) Considering that the UK was at war for much of the nieces’ early lives, that was probably the safest place for them to be, instead of toughing it out in London, as Queen Mum so bravely and patriotically did in WW2. Let her RIP as she so well deserves.